On Nepal, Modi has much to be satisfied about. But the challenges begin now. The hope that Modi has generated will have to confront the image of India’s bureaucracy and intelligence, largely blamed for the poor implementation of projects and for getting involved in Nepal’s internal politics. Prime Minister Narendra Modi made every effort to be seen as Nepal’s best friend — a commoner, a pilgrim, the guardian of a Nepali in need, and less of a prime minister of a big country. By the time he left Nepal, he had won the hearts and minds of the Nepalese, imprinting deeply the idea that he alone has the will and ability to transform Nepal into a prosperous country. His repeated emphasis on India’s respect for Nepal’s sovereignty, and the message that missed opportunities of the past and failed promises should not act as speed-breakers in “our future journey to prosperity together”, were perhaps aimed at looking ahead at the future, not harping on the past. Modi knew that all these personalities he projected would consolidate his image and goodwill in a country where India is perceived as a neighbour with a big gap between promise and delivery — and, of late, a neighbour that involves itself more in Nepal’s internal politics, and pursues a policy of “divide and rule”. Modi brought along with him Jeet Bahadur Saru Magar — a Nepali boy that he had a chance meeting with in Ahmedabad about 16 years ago and adopted — ostensibly to “reunite” him with his family that was discovered two years ago, at Modi’s initiative. Jeet had come to Nepal two years ago, soon after the family was discovered, and was in constant touch with them. But Modi’s decision to bring Jeet along, get his entire family to Kathmandu, pose with them for a photo-op and give them gifts, generated such publicity that this affair appears to have paid him the biggest dividend of his Nepal visit. “Years ago, I came here as a pilgrim. And anyone who comes to Nepal once, will always belong here [sic]” he said in Nepali, before he began his extempore speech in the parliament. By projecting the image of a benevolent guardian and a devotee of Shiva — from Somnath to Pashupatinath, via Vishwanath — he could easily establish a bond with a predominantly Hindu Nepal, a country with a potential for religious tourism. Jawaharlal Nehru disapproved of then President Rajendra Prasad’s wish to go to the renovation ceremony of the Somnath temple in the early 1950s on the ground that it would set a wrong precedent in a secular country. But almost 60 years later, Nehru’s successor took pride in offering special worship at the Pashupatinath temple and spending an hour there as a devotee, something none of India’s prime ministers before Modi had done. 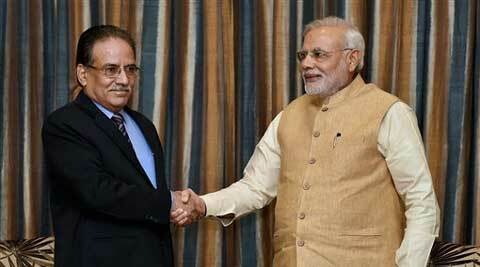 That the new Indian prime minister is a commoner and “someone like us” was the general feeling in Nepal. Was it all only part of diplomacy? Nobody in Nepal seems to believe that, at least for now. But then Modi , the prime minister, was much at ease in delivering the messages he wanted to — that Nepali politicians must rise above partisan politics in making the constitution. While he sent across the message that India would be happy if Nepal wrote a federal, republican constitution, he also said “that must bring poor and rich, rural and urban, hill, mountain and Terai together”. That was a clear disapproval of the identity-implying caste- and ethnicity-based federalism — a common agenda of the Maoists and Madhesi parties — something India had lent its support to earlier. His emphasis was more on linking the country and its people with its diverse geography, culture and socioeconomic strata than wedging a divide on caste and ethnic lines. He also maintained his silence on whether India wishes Nepal to be a secular or a Hindu nation. A quiet warning and praise for Maoists for switching to “Buddha from Yuddha” — from war to peace — also showed that Modi was cautiously optimistic about their contribution to the constitution-writing. “The entire world is looking at you. Your success will discourage many who believe weapons can bring about change” — the hidden message was more obvious. The consequences of Nepal, which has already bungled one chance, not having a constitution on time would be enormous. After all, an orderly society, guided by a constitution alone, will provide the stability that is the pre-requisite for business and investment — Modi’s clear focus. The 5,600 MW Pancheshwar project, which remained stalled for 18 years after the agreement, will see its work start within a year. He assured the Nepali side that India will not want Nepal’s electricity or power for free: “We will buy it, and that alone will change the face of Nepal… We will provide power to you now, but 10 years hence, you will remove our darkness,” he said, hinting India will move fast on the implementation of projects now. Modi returns to New Delhi with much to be satisfied about. But the challenges begin now, as the promises enter the delivery phase. More than that, the hope that Modi has generated will have to confront the image of the Indian government’s bureaucracy and intelligence, largely blamed for the poor implementation of past projects and for getting involved in Nepal’s internal politics. The bureaucracy will not refute the allegation. But it cannot be wished away so easily. The challenge lies in getting it to perform as per decisions reached at the political level on both sides. Modi’s probation in Nepal begins now.